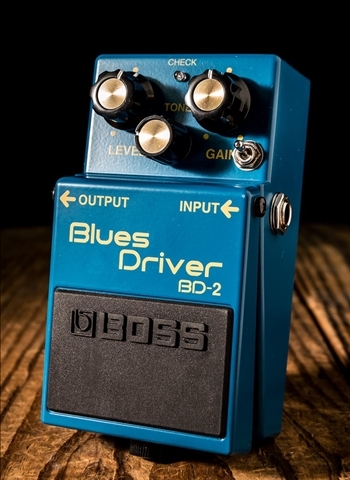 The Boss BD-2 has a pretty good tone to start with. The pedal you have now is the culmination of many ideas and modifications that Robert Keeley had made to the pedal over the years. Every component added is of the highest quality. The parts added will increase the warmth of the pedal and add a level satisfaction to your playing. Film capacitors are used in the tone section to provide the smoothest mid-range and high frequency components to your tone while increasing the bass response of the pedal. This pedal has been modified to have slight asymmetrical clipping. This mod gives you 2nd order harmonic distortion. This has a very musical sound. At very high saturation levels it almost becomes an octave type of sound effect. Robert was never big on bass boosts in general so the switch on this pedal is mild in its effect on your tone. Moving the Phat switch up engages this tone. There is a slight bass increase felt when notes are played on the open E and A strings. Strum those strings while moving the switch back and forth to get an initial feel of the possibilities. It might be a good idea to turn the Phat switch off under loud situations if there is too much low end in your sound. The Phat mod also uses silver mica capacitors, which reduce the noise of the pedal to lower than stock levels. The only variation that has been made from the original Keeley BD-2 Phat was the use of audio grade electrolytic capacitors in the signal path. We felt that this lowered the noise floor further and improved the overall signal clarity with cleaner tones.